The fight over immigration is a fight over identity. A battered yellow school bus rumbles up a bumpy dirt road on the outskirts of Sasabe, a small Mexican town just over the border from Arizona. At the top of the hill, the bus winds around brick and mud huts. Ragged children stand in the doorways, and emaciated dogs forage for scraps. The bus passes dented pickups and old cars without wheels and stops in a dusty clearing, where it disgorges about 40 teenagers dressed in blue jeans and carrying small knapsacks. One boy's t-shirt features a picture of Che Guevara. A girl's pale blue top says adorable in sequined letters. They are subdued, almost expressionless. They mill around, waiting for the coyotes, or smugglers, who, for a hefty fee, will take them in pickup trucks to the border. There, they will climb through holes in the barbed wire fence separating Mexico from the United States. Some will not make it through the 100-plus-degree Arizona desert on the other side (from October 2004 to October 2005, 261 would-be migrants died in the desert before reaching Tucson or Phoenix) and about one-third of them will be apprehended by the U.S. Border Patrol. But, over the course of a year, almost two million will make it, sometimes after several tries, and enter the underworld of undocumented migrants: working on farms, as day-laborers in construction, as servants and maids, or in sweatshops and meatpacking plants. Unable to protest mistreatment, they will be subject to abuse and exploitation, but most of them will still fare better than if they had stayed in their native villages. This influx of migrants into Arizona—and the fact that many stay in the state rather than moving north or west—has created a political explosion. In November 2004, anti-immigration activists won a bruising campaign to pass Proposition 200, which denies "public benefits" to people who can't prove their citizenship, despite the opposition of the state's congressional delegation, including Republican Senators John McCain and Jon Kyl; Democratic Governor Janet Napolitano; and major business groups and labor unions. Last spring, the Minuteman Project, which George W. Bush wrote off as a group of "vigilantes," set up shop in Tombstone, near the border, to dramatize the failure of the Border Patrol to prevent "illegals" from getting through. Republican state legislators, equally hostile to McCain and Napolitano, are trying to expand Proposition 200 and plan to make illegal immigration the focus of the 2006 elections. "We are ground zero" in the battle over immigration, warns former Arizona House Majority Whip Randy Graf, who spearheaded the campaign for Proposition 200 and is now running for the Tucson-area House seat to be vacated by Representative Jim Kolbe. The furor over illegal immigration is sweeping the country—from California and Washington to Virginia and Tennessee, and even up to Vermont, New Hampshire, and Minnesota—but Arizona is indeed ground zero, having surpassed neighboring states as the principal gateway to the United States for illegal immigrants from Mexico and Central America. Beltway politicians who want to clamp down on the border claim this furor is the result, as Colorado Republican Representative Tom Tancredo has suggested, of immigrants "taking jobs that Americans could take." 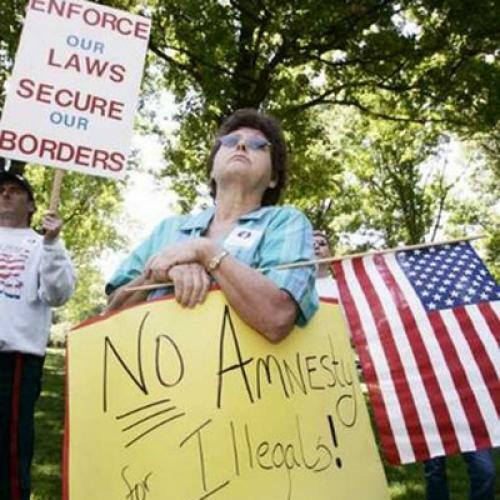 And many Americans far from the Arizona border certainly believe that—in low-immigration West Virginia, for example, 60 percent of respondents in a recent poll agreed that "immigrants take jobs away from Americans." But that's not what's happening in Arizona's citrus groves or hotels or restaurants. And, in Arizona, those who are most up in arms over illegal immigration are far more concerned with its socio-cultural than its economic effects. They are worried about what is commonly called the "Mexicanization" of Arizona. That kind of cultural concern extends to legal as well as illegal immigrants—and it can't be easily fixed by legislation. Mexicans began crossing the border to Arizona in the early twentieth century to work in "the five Cs"—construction, copper, citrus, cattle, and cotton—but, until recently, the great majority of illegal immigrants came through California and Texas. In 1990, for example, about 90 percent entered through those two states, while only about 5 percent came through Arizona. But, as the uproar over "illegals" grew—in 1994, for example, California passed Proposition 187, denying public benefits to undocumented workers—the Border Patrol instituted Operation Gatekeeper in California and Operation Hold-the-Line in Texas. These programs reduced illegal immigration to those states, but not overall. Instead, illegal immigrants were simply diverted to Arizona's desert border, and, between October 2004 and October 2005, about half of the four million illegal immigrants who entered the United States came through Arizona. According to Princeton University sociologist Douglas Massey, about 1.5 million of them crossed the eastern part of the Arizona border, south of Tucson, and about 470,000 entered through the area around Yuma, near the California border. Going through the desert is far more dangerous than walking over a bridge into a Texas or California border town or even fording the Rio Grande. And it's more expensive, too. But Mexicans and other Latinos are willing to pay the coyotes, because they hope to find well-paying jobs in the United States. And, relative to where they came from, they will. In 2000, according to the U.S. Department of Agriculture (USDA), a farm worker in Mexico could expect to make $3.60 in an eight-hour day, while his counterpart in the United States made $66.32 in the same period. The discrepancy has increased since the North American Free Trade Agreement (NAFTA) went into effect in 1994, removing tariff barriers on the importation of U.S. farm products and decimating small farmers in Mexico. Says Sandra Polaski, a trade expert at the Carnegie Endowment for International Peace, "Small farmers who produced for subsistence but also for the market lost their market access." According to the USDA, Mexican farm income fell 4.3 percent per year during the 1990s. Young men and women left in search of work, and, while some of them found jobs in U.S. factories on the border (maquiladoras), many of them crossed the border in search of better-paying jobs. Most of those who make it do find jobs—92 percent of males, according to one estimate. And, with undocumented workers adding to the normal population increase, Arizona's Latino population has ballooned, going from 19 percent in 1990 to 25 percent in 2000. Phoenix, which was once a primarily Anglo town, has gone from 20 percent to about 34 percent Latino. Says former Arizona Attorney General Grant Woods, one of the state's prominent Republicans, "When I was in the first grade in 1960, Phoenix was the same distance from the border. Phoenix now feels much more like a border town than it did even ten years ago. Billboards in Spanish, a lot of people speaking Spanish. Most of us think this is great, but a lot don't." This transformation in Arizona society and culture, along with the disorder created by the dramatic rise in border-crossings, has made immigration the biggest issue in Arizona politics. In the 2002 gubernatorial election, when Napolitano barely edged out Republican Representative Matt Salmon, the two candidates rarely mentioned immigration. But, soon after Napolitano took office in 2003, she and her chief of staff, Dennis Burke, were astonished to discover that the state's voters were preoccupied with the issue. Says Burke, "The first time we looked at polling, the number-one issue was immigration, not education. Then, a year and a half ago, it got pretty visceral. It started to permeate all issues." That was largely because political activists and conservative Republican state legislators had begun organizing. In July 2003, Phoenix resident Kathy McKee established the Protect Arizona Now Committee and got a lawyer to write what became Proposition 200, basing it on California's Proposition 187. It was put on the November 2004 ballot. And, although almost the entire Arizona political establishment opposed it, the measure still garnered 56 percent. Then, last year, the state legislature passed a raft of anti-immigrant bills, including measures to deputize local and state police officers to enforce immigration laws and to broaden the definition of the "public benefits" denied to illegal immigrants under Proposition 200. Napolitano vetoed all but one of the bills but has since backtracked in the face of growing public pressure. And Russell Pearce, the powerful chairman of the Arizona House Appropriations Committee—who, with Graf's departure in 2004, has become the leader of the legislature's anti-immigrant force—is currently championing legislation that would make English Arizona's official language and construct a wall along the entire Arizona border. Graf, Pearce, McKee, and the Republican legislature have clearly tapped a growing sentiment among the state's white voters. Wes Gullett, a political consultant and a key adviser to John McCain, recently conducted a poll in Cochise County, south of Tucson, to test voter concerns. "Instead of asking what are the top three issues," Gullett says, "we have to ask what are the top four, because the first three are immigration. You have to ask, 'What do you care about other than immigration?' It's crazy down there." But what, exactly, is this craziness about? In Washington, politicians and political organizations regularly attribute the obsession with immigration to illegal migrants taking the jobs of native-born Americans. Tancredo makes that claim, and so do the two leading groups advocating restrictions on immigration, the Federation for American Immigration Reform (fair), which bankrolled Proposition 200, and the Center for Immigration Studies. That did happen in Midwestern meatpacking plants several decades ago, and it may still be happening in some parts of the country, but it does not seem to be the case in Arizona, where unemployment hovers below 5 percent and where construction, agriculture, and tourism are plagued by acute labor shortages. Illegal immigration doesn't even seem to be having a dramatic effect on wages, with pay for unskilled work in Arizona regularly exceeding the minimum wage. Unskilled workers currently make up 32 percent of Arizona's labor force, and they are constantly in demand. Tom Nassif of Western Growers, a trade association, recently complained that the construction industry was "siphoning off" the migrant workers that growers needed in the field. "Farms will not have enough workers to harvest their crops," he warned. Meanwhile, Arizona's tourist industry says it can't find enough workers for its hotels and restaurants. Bobby Surber, the vice president of Sedona Center, who runs three restaurants, two shopping plazas, and a resort, and employs 200 people, says, "Even though we pay larger than average, and full medical and dental, we cannot find enough employees." Of course, Arizonans could still believe, just as Americans in West Virginia do, that illegal immigrants threaten their jobs. And pollsters invite this response by always asking about the economic effect of immigration and refraining from raising uncomfortable cultural concerns. But, in interviewing Arizonans, one rarely encounters complaints about illegal immigrants taking jobs away. One does hear about the cost of state services for illegal immigrants. Indeed, even the Latinos who voted for Proposition 200 were worried about the burden that illegal immigrants were placing on schools and hospitals. And, in border towns, crime and disorder are pressing issues. (Some of the coyotes double as drug smugglers, and the migrants traipse through farms and ranches.) But, among many Arizonans, the most important issues are cultural. They fret about "Mexicanization"—about Arizona becoming a "Third World country" or "the next Mexifornia." In interviews I conducted last fall, leaders of the movement to restrict immigration usually began by expressing concerns that illegal immigration was undermining the rule of law and allowing terrorists to sneak across the border—concerns they seem to believe are most likely to win over a national audience. But they invariably became most animated, and most candid, when talking about what they see as the unwillingness of Mexican immigrants—legal or illegal—to assimilate into American culture. Connie insists that the Minutemen are neither "extremist" nor "racist," but, as we ride along the border in her Ford Navigator, Connie voices distinctly cultural and racial concerns. She says that the illegals she sees coming across the border are the "darker" Mexicans. Mexican President Vicente Fox, she says, "doesn't want them in the country." She speculates that Mexicans might want to take over Arizona: "In Mexico, they are taught this land was taken from them. They are not taught they were paid tons of money for it. There is a belief they want this back." (After defeating the Mexican army in 1848, the United States bought all of California and the Southwest from Mexico for $15 million.) When I comment that California has remained in good shape despite massive immigration, she takes exception. "California is not a shining example," she says. "You have the Chinese, the Vietnamese, the Russians, all these people immigrating. How many languages do you have to have on the ballot?" Asked if she would support McCain's proposal to allow Mexicans to enter the country legally as guest workers, Connie demurs. "Who is going to pay for it?" she asks. "When my grandmother came from Czechoslovakia, one thing she did was assimilate. She was proud to be an American. Their attitude is, 'We won't assimilate.'" That's what bothers Graf as well. "We are talking about assimilation," says the congressional candidate, as we sit in his East Tucson campaign headquarters. "I don't have any problem about anyone who wants to salute our flag and learn our language and be a citizen. What got me into the whole issue was that I was standing in line in a Safeway, and this woman was ahead of me, and she had an infant, and was pregnant, and her mother was with her. She was paying for groceries in food stamps. And, when the clerk asked for her signature, she acted like she didn't understand English, and neither did her mother. I found it odd that an entire family could be here on welfare and not speak any English. On welfare!" Graf's chief ally is Pearce, who lives in the Phoenix suburb of Mesa. Last fall, he complained to a reporter from Stateline.org about his hometown: "It's not the Mesa I was raised in. They have turned it into a Third World country," he said. By "they," Pearce means Latinos in general. On his website, he warns, "Over 800,000 Americans fled California last year because LA became a clone of Mexico City." Pearce, like Connie and Graf, envisages a cultural conflict between the white America he grew up in and an invading army of dark-skinned, Spanish-speaking immigrants from south of the border. Ray Borane, the longtime Democratic mayor of Douglas, a border town in Cochise County, laments that Graf "represents the majority opinion" in the state. That may be an exaggeration, given Napolitano's and McCain's continued popularity, but Graf and his angry allies do represent a significant segment of voters—perhaps one-third or more—who are up in arms. And longtime observers of Arizona politics confirm that a concern with Mexicanization lies at the heart of their opposition to illegal immigration. "Nobody is afraid of jobs," says Gullett, the McCain adviser. "We have got labor demand. That's not a problem. There is no feeling that people are losing their jobs. There is a tremendous fear that our community and our way of life is changing." Dave Wagner, the former political editor of The Arizona Republic, who is writing a book about Arizona politics, says that, in Phoenix, "Mexicans and Mexican-Americans have their own culture and stores. It is possible if you are Spanish-speaking to disappear into that culture. That scares the hell out of some people." Says Woods: "Arizona has changed dramatically in the last 20 years, and a lot of people are uncomfortable with that." It's a discomfort that politicians like Graf and Pearce hope to take advantage of. They want to purge the Republican Party of pro-business conservatives like McCain, Woods, Kolbe, and Phoenix Representative Jeff Flake, all of whom favor a guest-worker program and some form of amnesty for undocumented workers already in the United States. Graf ran against Kolbe, an opponent of Proposition 200, in 2004, and, in spite of being massively outspent, got 43 percent of the vote. He's running again, and, with Kolbe out of the race, he has a decent chance of winning the Republican nomination. Republicans in the legislature are also preparing a witches' brew of new anti-immigrant legislation for the term that begins in January. And the underlying conditions that have fueled their protest and made Arizona ground zero are likely to persist. Arizona businesses have relied on migrant labor for 100 years. Says Phoenix College political scientist Pete Dimas, author of Progress and a Mexican American Community's Struggle for Existence, "Immigrants have provided the cheap labor on which this whole part of the country has depended." And the demand for unskilled labor is likely to continue. According to statistics from the Department of Labor, 13 of the 20 occupations in Arizona that will experience the highest growth from 2002 to 2012 employ unskilled workers. Many of these jobs in food-processing or building service are now spurned by the native-born and are filled by illegal immigrants. And, with all of Mexico's tariffs on farm products due to disappear under NAFTA, and with the Central American Free Trade Agreement going into effect, the supply of unskilled labor looking northward is likely, if anything, to mount. As immigrants continue to cross the border, the "culture war" is unlikely to abate. Connie is right. Mexican and Central American legal and illegal immigrants probably won't assimilate in the way her Czech grandmother did. European immigrants who came to the United States in the last century had to travel over an ocean to arrive here, and many of them came from countries undergoing political or economic upheavals. Their identification with the homeland rarely lasted past a generation. That's not as true of Mexican or other Latino immigrants, who have their own claim on the culture of the West. Many of the migrant workers who crossed the border after 1848 did so to make money to bring back home. They retained their language and national identity. According to Douglas Massey, Jorge Duran, and Nolan J. Malone in Beyond Smoke and Mirrors, 23.4 million of the 28 million undocumented workers who entered the United States between 1965 and 1985 returned to Mexico. What's changed in the last decade, ironically, is that more extensive border enforcement has discouraged illegal immigrants from returning to Mexico for fear that they will be unable to get back into the United States. Still, many continue to support extended families in Mexico, call themselves Mexicans, and consider their primary language Spanish. They are contributing to a bicultural America that stirs fear and resentment among some native-born Americans and that will continue to inspire calls to close the southern border. Arizonans on both sides of the controversy are looking to Washington for solutions. They know that states can't pass their own guest-worker programs; nor can they police their own borders. But there is little chance that the Bush administration and Republicans in Congress—sharply divided between social conservatives and business interests—will be able to pass legislation this year. And, even if the House, the Senate, and the White House could agree on an approach, it would not end the furor over immigration. Last month, social conservatives in the House, led by Tancredo and Wisconsin Representative James Sensenbrenner, passed a punitive bill that would erect new walls along the border, make illegal immigration a felony, and require employers to weed out illegal workers by checking their immigration status against a national database. In the Senate, McCain and Massachusetts Democrat Edward Kennedy introduced a bill that is backed by business and by some labor groups. It would let migrant workers obtain renewable three-year visas and allow undocumented workers already in the country to stay provided they pay a fine. McCain and Kennedy probably can't get their bill through the Senate—too many Republicans fear being tagged as proponents of "amnesty" for illegal immigrants—but they could certainly muster enough votes to prevent the Senate from passing a version of the House bill. In the past, Bush has leaned toward McCain's approach—the president encouraged McCain after the 2004 election to seek Kennedy's support for a bill—but he has recently attempted to appease social conservatives, praising the House's measures to "protect our borders and crack down on illegal entry into the United States." Bush holds out hope for a Senate bill that would somehow combine McCain's approach with Tancredo's. But that's unlikely to happen. Even if Congress were to adopt one of these approaches—or a combination of the two—it would not quiet the controversy. Punitive approaches have either had unintended consequences (for instance, encouraging illegal immigrants to stay in the United States rather than return to Mexico) or have proved unenforceable. Border Patrol spending has increased over 1,000 percent since 1986 without reducing border-crossings. McCain and Kennedy's approach is far better, acknowledging the inescapable reality of Latino immigration and its net benefit to the U.S. economy. But granting amnesty to undocumented workers, and inviting new workers in, will not satisfy Americans who are offended by the growing presence—legal or illegal—of Latinos in their midst. And combining the two proposals would more or less reproduce the Immigration Reform and Control Act of 1986, which hiked border spending, threatened employer penalties, granted amnesty to undocumented workers, and led to almost two decades of clamor over immigration. That furor will not abate until at least one of two conditions is met. The first is a dramatic generational change in the cultural attitudes of non-Latino Americans—meaning the acceptance of biculturalism in large parts of the United States, including Arizona. Frank Pierson, the supervising organizer of Arizona's Valley Interfaith Network, a coalition of church and labor groups that promotes cultural integration, wants Arizonans to adopt the biblical tradition of showing "love for the stranger." But non-Latino Americans probably have to reach a point where they no longer see immigrants from south of the border as strangers at all. The other condition is a change in the unequal economic relationship between the United States and its neighbors to the south, which would reduce the supply of unskilled laborers seeking jobs in the United States. Such a change could probably only occur if the United States were to assume the same responsibility toward Mexico and Central America that the more prosperous nations of Western Europe did toward Spain, Greece, and Portugal when they wanted to enter the European Union—granting them aid, along with protection of their industries and agriculture, over a transitional period. But neither condition is likely to be met in the near future. Americans are not ready to embrace the teenagers who gathered in Sasabe as their own, and U.S. business is not ready to see Mexico and Central America as anything other than a platform for exports and investment. As a result, the conflict over Latino immigration will continue. And, if what's happening on the Arizona border is any gauge, that's not something to look forward to.